Thank you for visiting the on-line arm of The Curio Shoppe, a small collectibles store offering Seraphim Angels, Hummels, Department 56, Lowell Davis, Chilmark, All Gods Children, Anri, and located in Greensburg, Indiana. 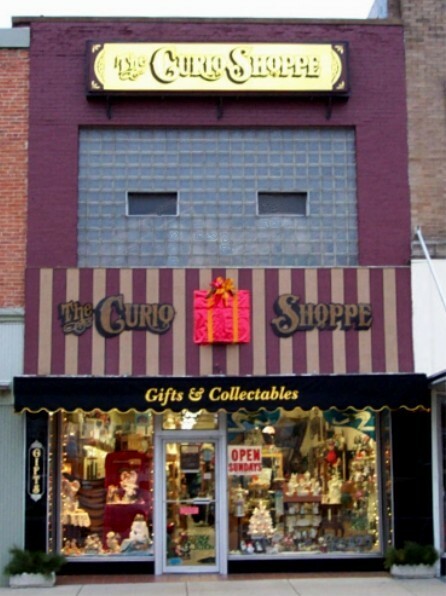 The Curio Shoppe, "the biggest little gift shop in the U.S." Besides Seraphim Angels, M.I. Hummel, Department 56, Lowell Davis, Chilmark, All Gods Children, and Anri also offers a wide variety of officially licensed collectibles and gifts. Both the serious collector and the general gift-buyer are sure to find the perfect selection at The Curio Shoppe. Through this on-line web page, you can view a selection of some items available. Feel free to give us a call, if you see anything of interest, and I will be happy to help you place an order. Same-day UPS shipping is available, so all orders will arrive with the utmost promptness.